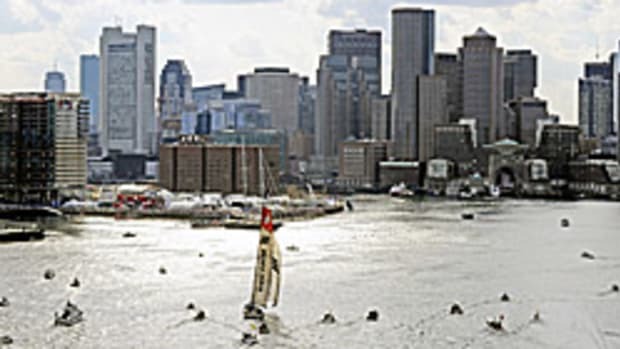 South Carolina ocean racer Brad Van Liew sailed over the finish line of the Velux 5 Oceans on Friday and into the record books, winning every leg of the 30,000-mile challenge for the second time in his solo sailing career. Not only is the 43-year-old now the only sailor in the 29-year history of the Velux 5 Oceans, formerly named the BOC Challenge and Around Alone, to have taken clean sweeps in two races (having also won each leg of the 2002-03 edition in Class 2) but he is also the first American to race solo around the world three times. By completing his historic third circumnavigation, Van Liew has surpassed the previous record set by his mentor Mike Plant. Having taken part in the 1986 edition of the race, then known as the BOC Challenge, and then the inaugural Vendee Globe in 1989, Plant was lost at sea en route to his third round the world race in 1992. Click here for information at the race website.